My husband & I have a favourite Thai restaurant in Seattle, WA called Racha Thai. We first had these 'crab delights' when we enjoyed a tasting menu there. I've adapted the concept to make at home (because we can't always drive down to Seattle just for yummy food). In a high sided pan or medium sized pot, start heating about 4 inches of oil slowly over med-low heat. Attach thermometer to the side of the pot. Taste mixture and adjust seasoning with salt & pepper as desired. When the oil reaches 350F, fry the wontons 6 or so at a time until golden brown, about 4 minutes. Do not cook too long, or filling will start to erupt through from the wonton. Serve warm with sweet chilli sauce. Hmmm that suonds absolutely heavenly. 5 forks. I love these thank you for posting. 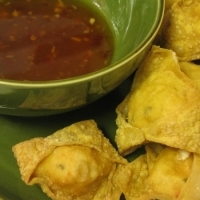 Crab Rangoons are what we call them here and they are so good. I will have to whip this up for my son-in-law--he always gets this when we go out! Like hollymayb's recipes? Never miss an upload!